In the early 2000s, if you were in high school, there was no bigger fashion statement than the jersey. Football, basketball, baseball, hockey, it didn’t matter. The more obscure and rare, the better. Hip-hop was the driving factor in this style revolution. Rappers like Jay Z (until he deemed it no longer cool on “What More Can I Say”) loved them, and so did Nelly, Snoop Dogg, Cam’ron and Fabolous, appearing in music videos rocking jerseys we never knew existed. The trend wasn’t for just for guys, either. R&B singer Mya is the foremother of the jersey dress crusade, highlighted by her UNC Michael Jordan ensemble in the classic 2000 video — with Jay Z — for “Best of Me;” a religious experience in the history of jerseys if there ever was one. And who could forget Mariah Carey’s Washington Wizards jersey-gown? She wore it as she serenaded His Airness nearly to tears at his final All-Star Game (ASG) in 2003 (more on that in a bit). 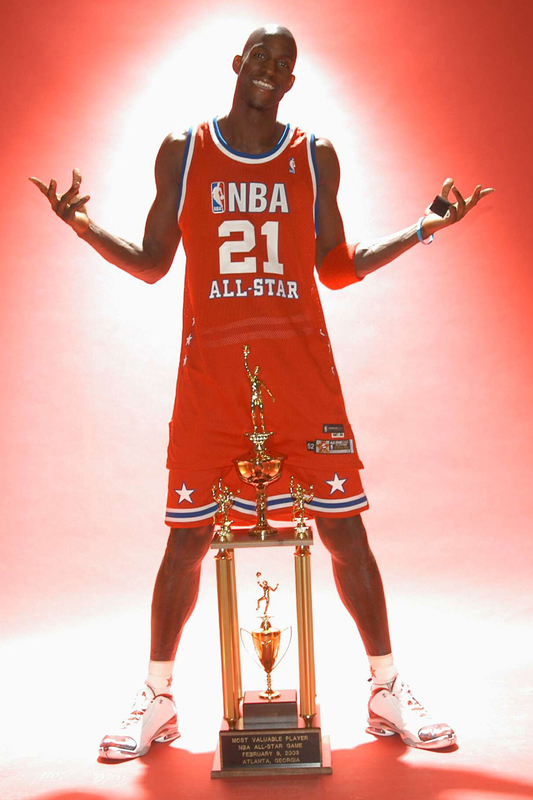 Jerseys have always helped drive the conversation and buzz during NBA All-Star Weekend. They’re statements in their own right. 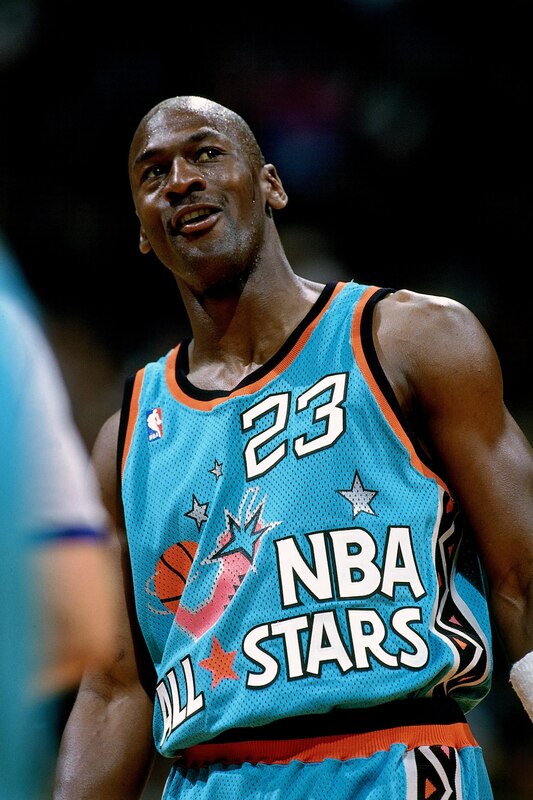 Here we not only take a look back at 16 of the most incredible ASG jerseys, we rank them. Note: 1997-2002 are not included because players wore their individual team jerseys. There was no ASG in 1999 due to the lockout. Kevin Garnett #21 of the Minnesota Timberwolves and Allen Iverson #3 of the Philadelphia 76ers pose as members of the 2005 NBA All-Star teams. Otherwise known as LeBron James’ first trip to the midseason getaway. The thing is, I like these jerseys. I really rocked with them back in ’05 when tall tees and jean shorts were a regular occurrence. 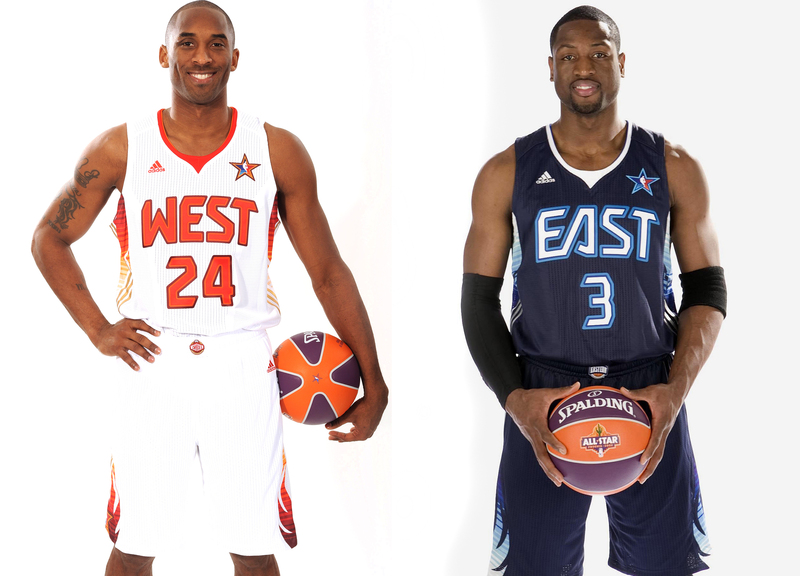 Kobe Bryant #24 of the Los Angeles Lakers and Dwyane Wade #3 of the Miami Heat pose in their 2009 All Star Uniforms. 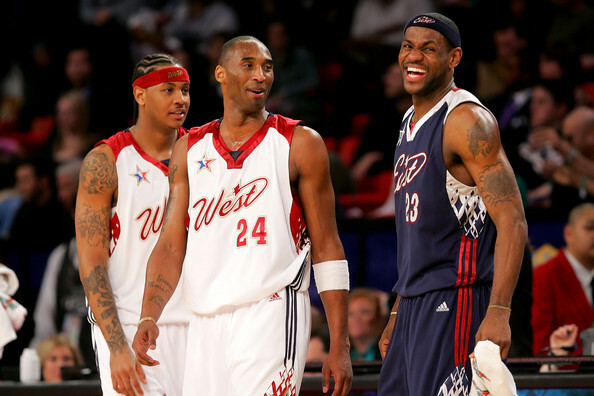 You know what kicked off All-Star Weekend in 2009? Just a random mixtape called So Far Gone from a random rapper from Toronto named Aubrey. Right. Like that’d ever catch on. Anyway, eight years ago, newly inaugurated President Barack Obama enjoyed his first All-Star Game as leader of the free world with the most unlikely MVP conclusion ever — Shaq and Kobe. Oh, and Dwight Howard was the leading vote-getter that year, too. My, oh, my how life changes over eight years. At least the jerseys were tough, though. 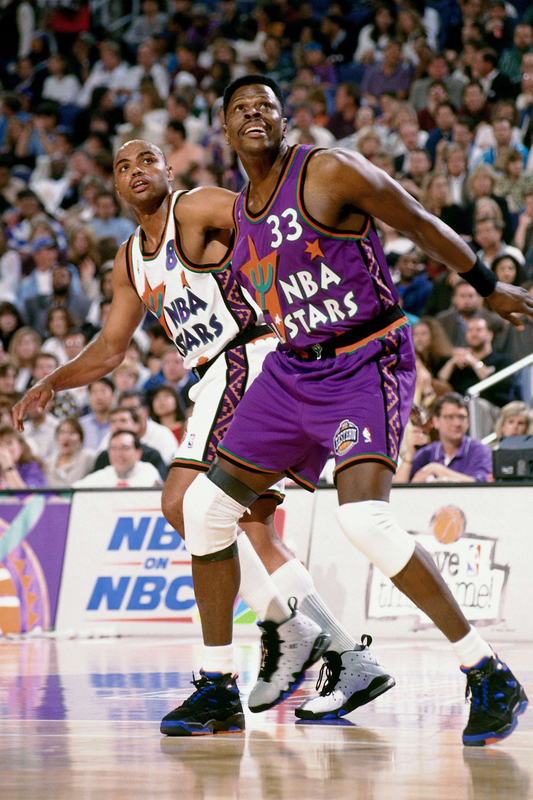 But these weren’t the hardest desert-inspired all-star jerseys as you’ll see later in the list. 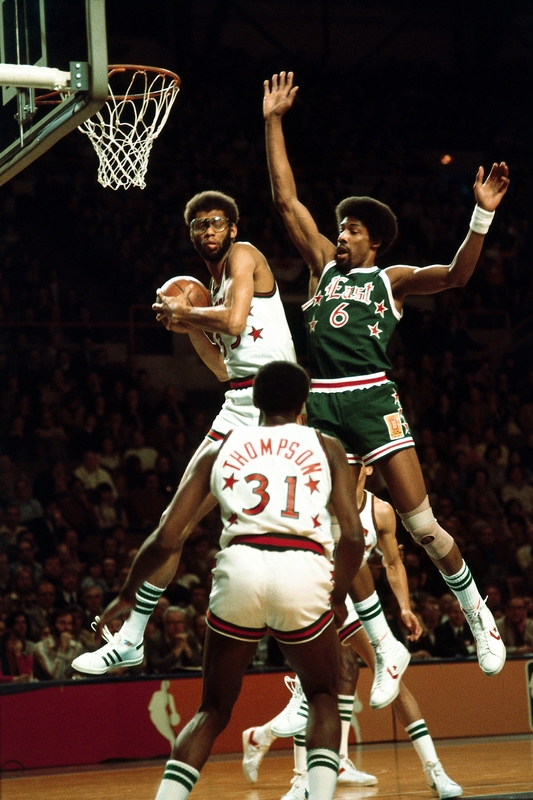 Kareem Abdul Jabbar #33 of the Western Conference All-Stars grabs a rebound against the Julius Erving #6 of the Eastern Conference All-Stars during an 1977 NBA All-Star game in Milwaukee, Wisconsin. 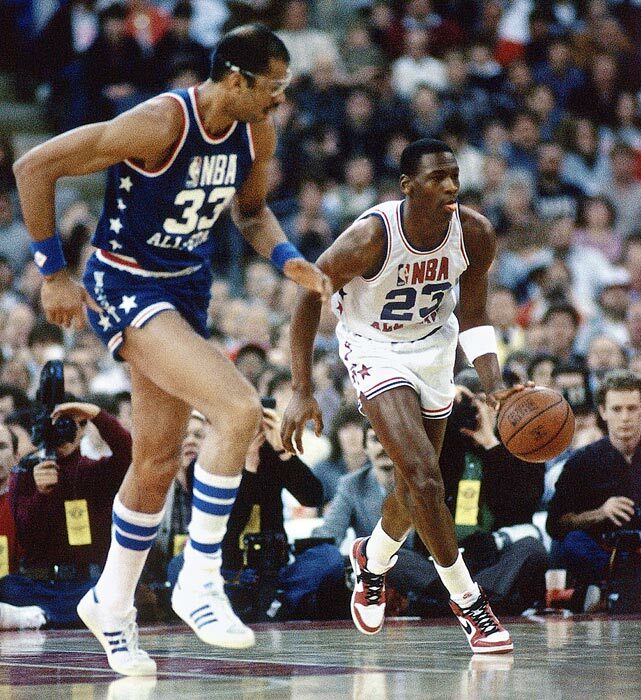 The first All-Star Game after the NBA/ABA merger turned out to be a classic. Not only did Dr. J drop 30 points and 12 boards, but the West won a thriller — 125-124. Finding a vintage jersey is always crucial to a fire ‘fit, so bonus points to whoever rocks that Dr. J ’77 ASG this summer. 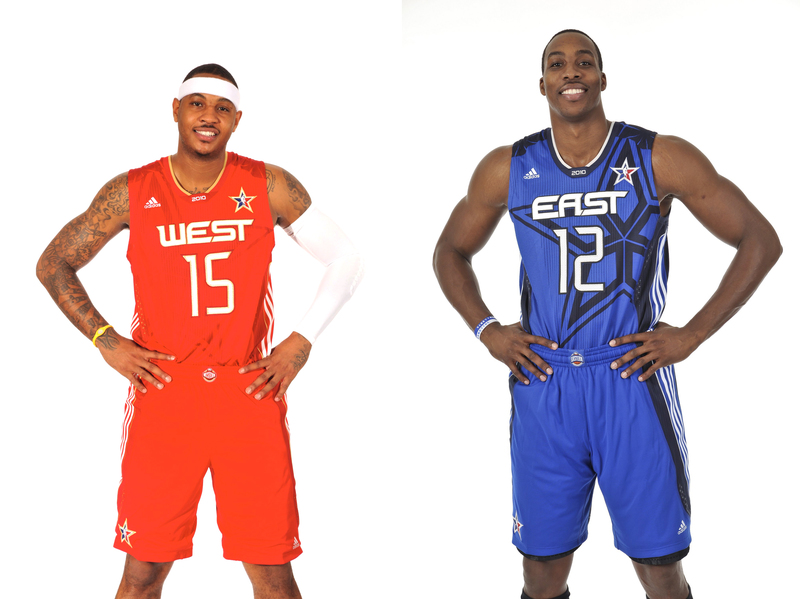 Carmelo Anthony #15 of the Denver Nuggets and Dwight Howard #12 of the Orlando Magic pose in their 2010 All Star Uniform. The jersey’s futuristic feel — with the sharp letters and skinny numbers was cold. And since we’re on the topic of “future,” we should’ve seen it coming then. The East won 141-139. The top three scorers for the East? Dwyane Wade, Chris Bosh and LeBron James. I think we all know what happened later that summer. 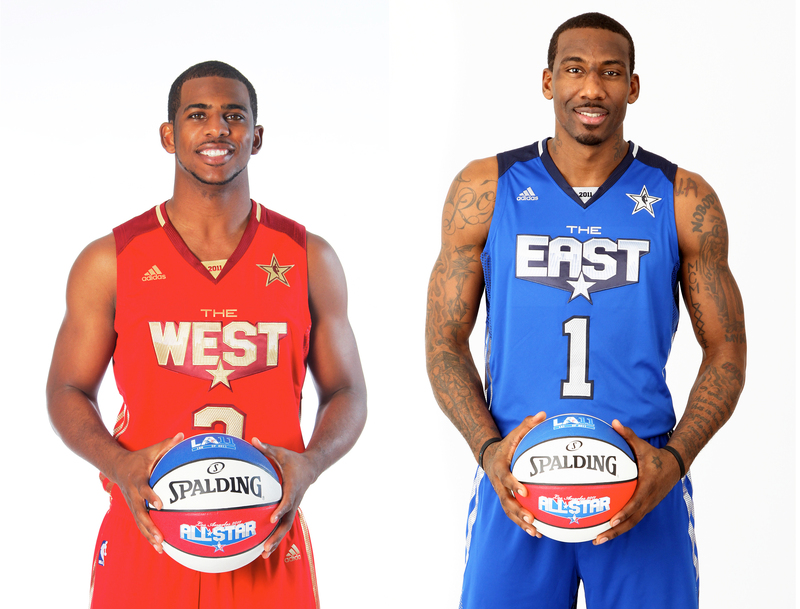 Chris Paul #3 of the New Orleans Hornets and Amar’e Stoudemire #1 of the New York Knicks pose in their All-Star uniform. Really, at this point, it’s a toss-up between 2011 and 2010. As of right now, these just look cleaner. The highlight of the weekend came when Blake Griffin jumped over the hood of a Kia in the dunk contest. The game itself was poppin’, highlighted by Kobe vs. LeBron. ‘Bron posted a man-sized triple double with 29 points, 12 rebounds and 10 assists. Kobe, however, took home MVP honors with 37 points, 14 rebounds and one memorable dunk on and two blocks of The King. 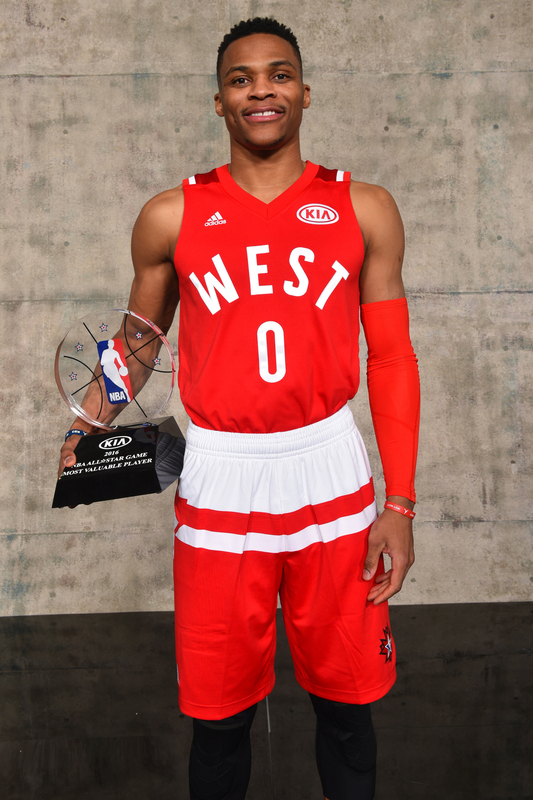 Russell Westbrook #0 playing for the West Coast all-stars wins the KIA Performance MVP Award after to the 2015 NBA All-Star Game at Madison Square Garden on February 15, 2015 in New York,New York. I know the lone number on the front wasn’t a fan favorite, but it is totally a favorite for this fan. I respect the subtle homage to the 1971 All-Star Game unis. 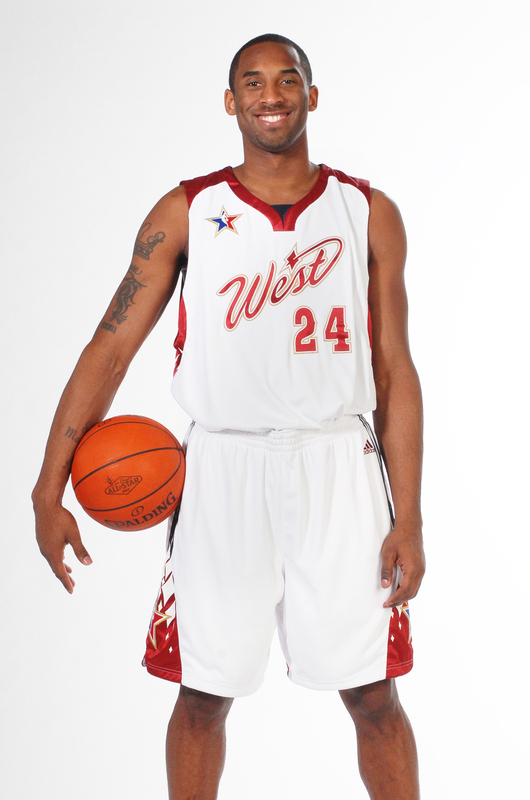 Kobe Bryant #24 of the Los Angeles Lakers poses in his 2007 NBA All-Star uniform at the Staples Center on January 22, 2007 in Los Angeles, California. Call me crazy (and that’s fine if you do), but I was always a fan of the semicursive letters on these jerseys. Also, an All-Star Weekend in Vegas? I bet that was … fun. Yeah, “fun.” I think that’s the right word. 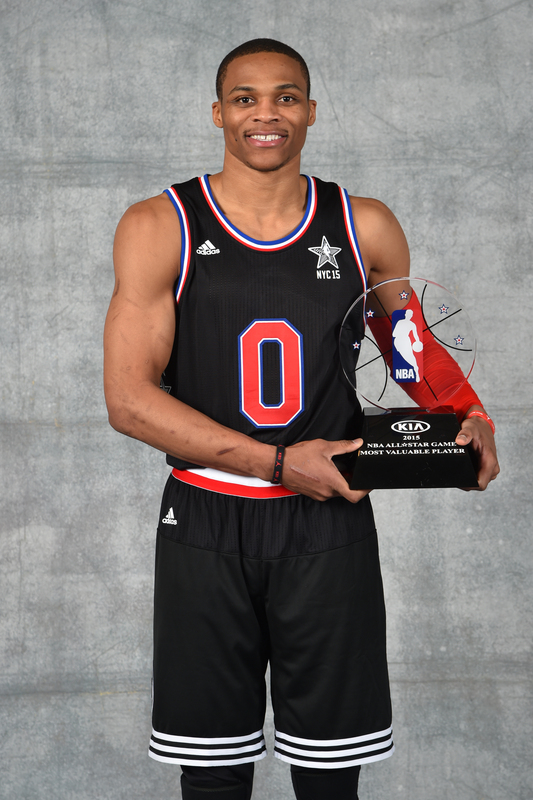 Russell Westbrook #0 of the West All-Stars poses for a portrait with the MVP Trophy of the 2016 NBA All-Star Game on February 14, 2016 at the Air Canada Centre in Toronto, Ontario Canada. My first All-Star Game/Weekend. Kobe’s last. And, unfortunately, Craig Sager’s last. At least the league gave all three of us some incredibly dope jerseys to remember. Seriously, part of me wanted to place this higher. 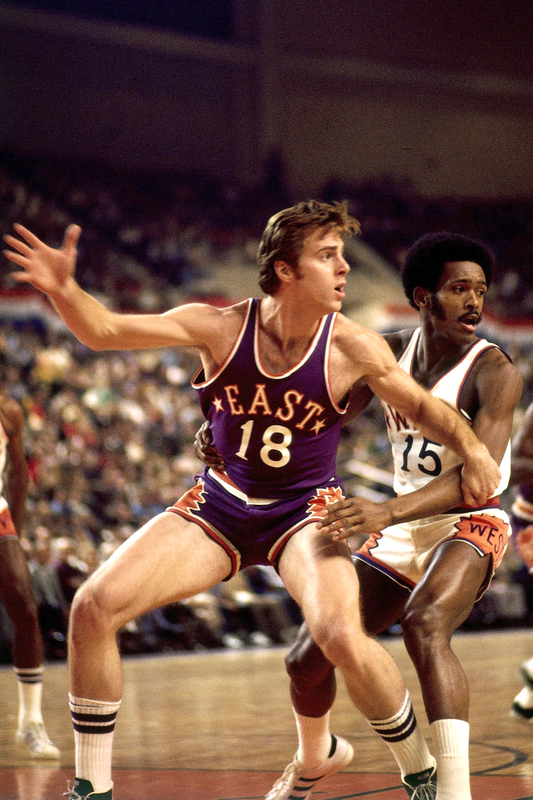 Dave Cowens #18 of the East All Stars posts up during the 1975 All Star Game on January 14, 1975 at the Veterans Memorial Coliseum in Phoenix, Arizona. Jerseys are basically about what looks dope and sleek wearing to cookouts now. Long gone are the days of wearing jerseys that are 27x too big. So thinking ahead, if someone is feeling frisky and wanted to either buy me a belated birthday gift or get an early start on Secret Santa, a 1975 Walt “Clyde” Frazier ASG jersey would be an incredible place to start. 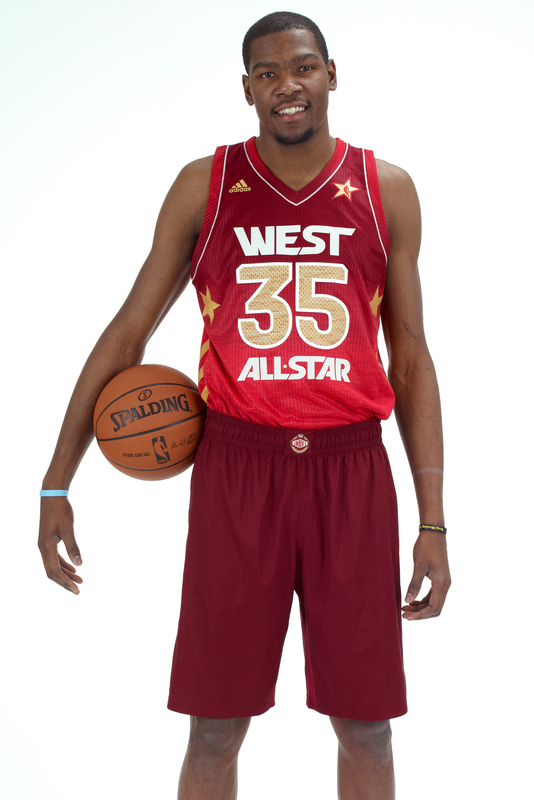 Kevin Durant #35 of the Oklahoma City Thunder poses for portraits as being named as a starter for the 2012 NBA All-Star game at the Rosewood Hotel on January 31, 2012 in Dallas, Texas. I’ll always remember this ASG for four distinct reasons. One, the colorway of the jerseys always stuck out to me — deep, dark colors on the shoulders and chest to lighter blue and red at the waist. Cold. Two, that ridiculous LeBron vs. Durant duel (which served as a preview of the Finals four months later). Three, Kobe Bryant looking pissed at James for not taking the final shot at the end of regulation. And, four, while this game was being played, a young boy from South Florida by the name of Trayvon Martin lost his life. His tragic murder started a movement. 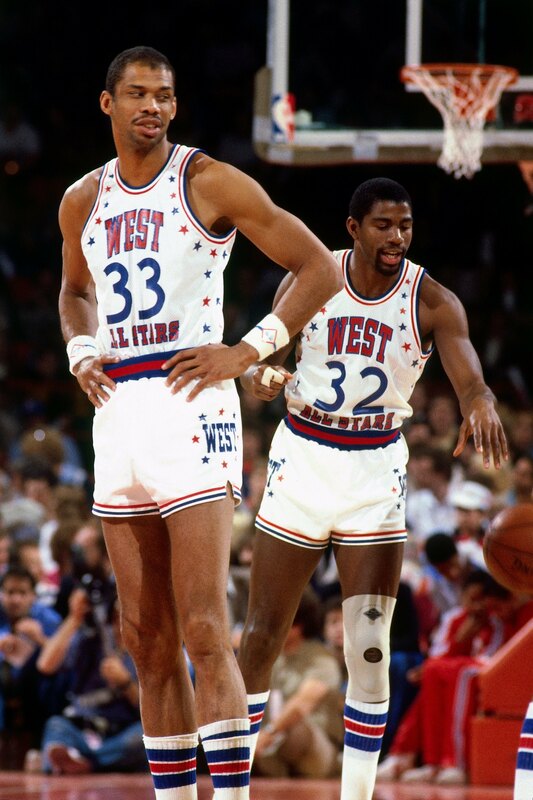 Kareem Abdul-Jabbar #33 and Magic Johnson #32 of the Western Conference All-Stars talk during the 1982 NBA All-Star Game played on January 31 at the Brendan Byrne Arena in East Rutherford, New Jersey. This says 1982, but the actual design of this jersey was used for several years, including the ’83 and ’84 games. Honestly, I wouldn’t be opposed to seeing this come back another one of these years. I wouldn’t be opposed to any of the top five selections making a return sooner than later. There’s beauty in simplicity. Kevin Garnett of the Western Conference is named MVP of the 52nd NBA All Star Game on February 9, 2003 at the Philips Arena in Atlanta, Georgia. Mannnnn, listen. Allow me to say louder for the people in the back — there’s beauty in simplicity. This jersey is still glorious. 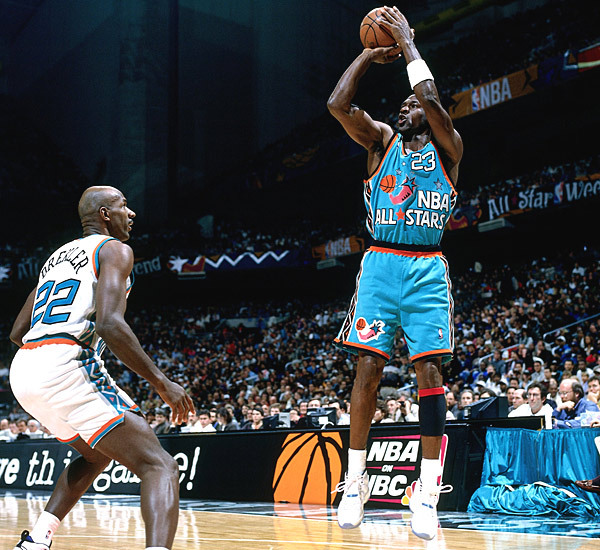 In Michael Jordan’s last All-Star Game, they decided to bring back the jersey he wore in his very first game (aka the “Freeze Out Game”). And leave it to M.J. to drain a go-ahead fadeaway in the waning seconds of the game in what should have been the most fitting end to an All-Star career, ever. The chest bump with Allen Iverson was classic, too. Everything was lining up in storybook form … until it went to hell with gasoline drawers on. Jermaine O’Neal fouled Kobe Bryant with one second remaining, who sent the game into overtime. The Western Conference won by 10. 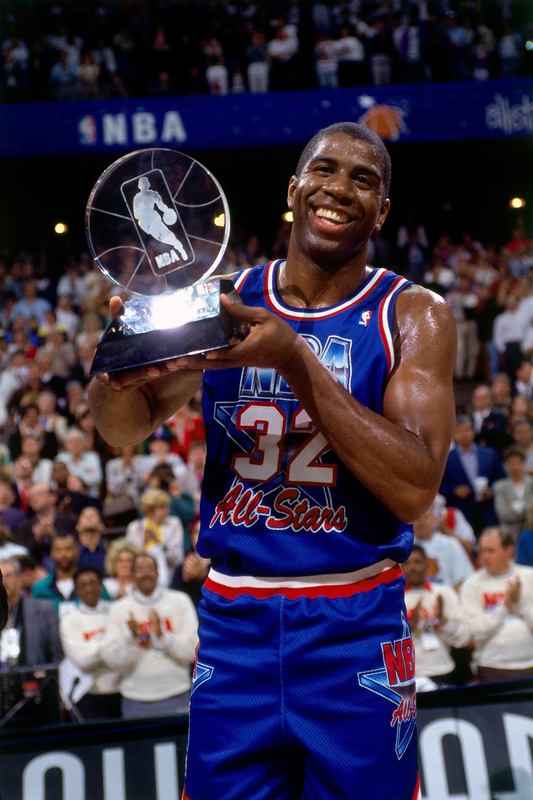 Magic Johnson #32 of the Western Conference All-Stars holds the MVP trophy following the 1992 NBA All Star Game on February 9, 1992 at the Orlando Arena in Orlando, Florida. Perhaps I’m biased because there’s a 1992 Magic Johnson ASG jersey in my closet. But under no debate or circumstance should these ever fall out of anybody’s top five. And on a different day, I’d probably name these top two or three. Either way, they’re tied for fourth only because I love the top three that much. Patrick Ewing #33 of the Eastern Conference All-Stars battles for position against Charles Barkley #8 of the Western Conference All-Stars during the 1995 NBA All-Star Game played February 12, 1995 at America West Arena in Phoenix, Arizona. Maybe the cartoonish lettering and design speaks to my ’90s childhood, but these will forever and a day have a place in my heart. And if anyone can find a link to a Gary Payton jersey, please don’t hesitate to shoot me a link via Twitter, Facebook, Instagram, LinkedIn or Snapchat. I’m desperate. I’ll even find my old BlackPlanet account if that’s the only way we can make this dream a reality. 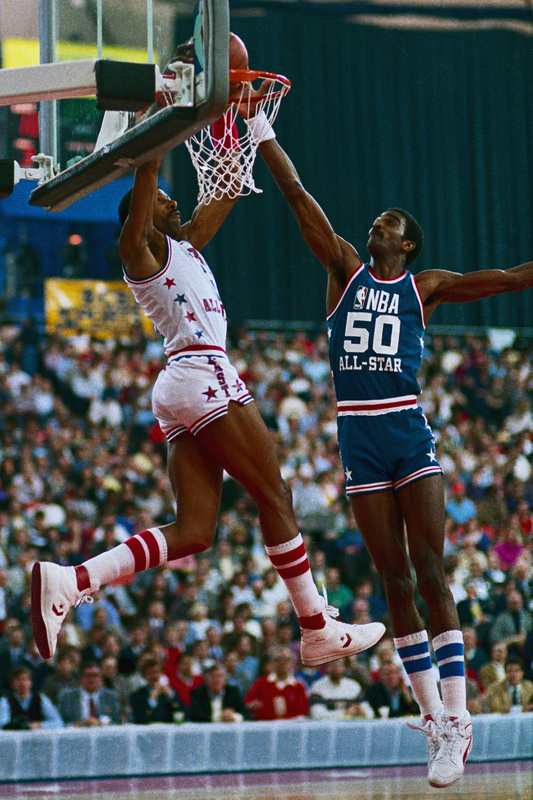 NBA Eastern Conference All Star drives for layup past defender Western Conference’s Ralph Sampson (50) in first half of the NBA All Star Game. Ever seen anything so beautiful it makes you want to cry and bite your fist? These jerseys do that for me. I wouldn’t be mad if you called them the greatest of all time. I love every single one of these equally and almost splurged a few months back buying Jordan’s ’89 rendition. If you can find the blue Western Conference jersey from ’85, you, sir or ma’am, are a unicorn. Michael Jordan #23 of the Eastern Conference All-Stars cracks a smile during the 1996 NBA All-Star game played February 11, 1996 at the Alamodome in San Antonio, Texas. This isn’t politics — thank the Lord — so the top selection isn’t up for debate. It’s No. 1 now. It has always been No. 1. And it will always be No. 1. For five clear, crystal-cut reasons. The teal color on the East jerseys was breathtaking. So much so that I can’t begin to tell you how many times I’ve stared at eBay for hours on end contemplating dropping a couple of hundred bones. It’s responsible for my single favorite All-Star Game starting lineup of all time: Penny Hardaway, Shaquille O’Neal, Grant Hill, Scottie Pippen and Michael Jordan. 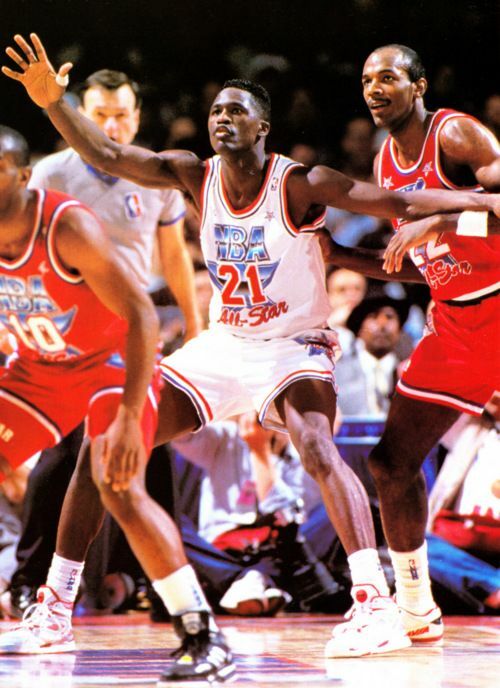 The shoes featured that day — headlined by the Jordan XI “Columbia,” Nike Zoom Flight 95, Air Penny and Reebok Kamikaze II to name a few — make it the greatest collection of kicks in All-Star Game history. 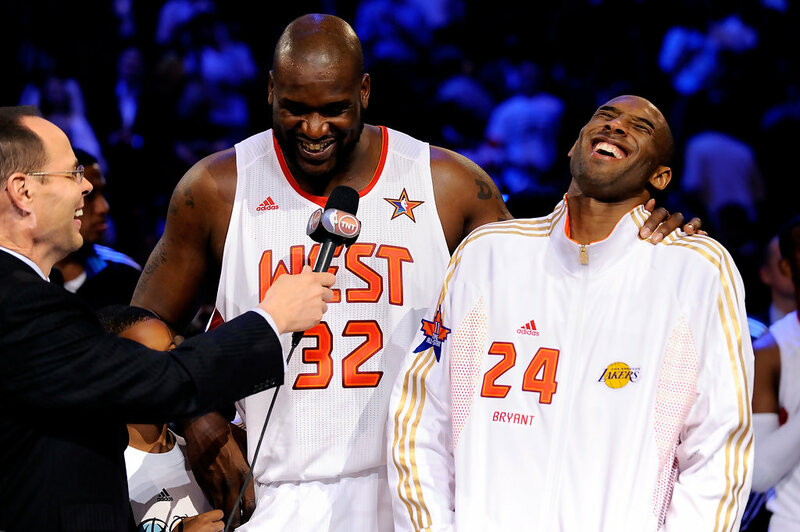 Shaq was absolutely robbed of All-Star Game MVP. Shaq absolutely had the greatest big man-on-big man dunk ever when he proceeded to fold David Robinson up like a lawn chair. In his own house, at that.